February 7, 2019 United Arab Emirates: The new Pirelli Ice Zero 2 studded tyres made their debut in an exclusive preview on the roads of the World Skiing Championships at Are in Sweden, where Pirelli is the main sponsor. 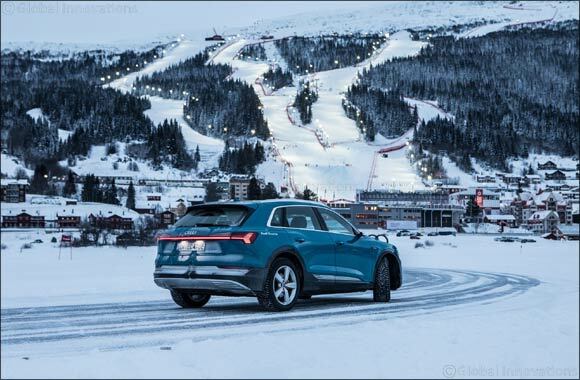 Pirelli in fact equips the Audi e-tron cars used by the event organisers and for the ice-driving experiences with Ice Zero FR and Ice Zero 2 rubber. The Ice Zero 2 tyres, designed to meet the mobility needs of top of the range cars on Nordic and Russian roads, will be officially launched on the icy roads of Pirelli’s proving ground at Flurheden in Swedish Lapland. For the activities linked with the World Skiing Championships in Are, Pirelli provided two different types of tyre: the versatile Ice Zero FR, for typical Nordic driving conditions, and the new Ice Zero 2 tyres, for more extreme situations. This new tyre for the Nordic market has been designed for top of the range cars, including electric cars. Electric cars, which offer all their torque from low revs, require the maximum amount of traction, especially in low grip conditions that are typical of winter: including zero grip on ice. Not only that, but for the studded Ice Zero 2 tyres, Pirelli’s engineers have also worked on limiting the road noise often typical of this type of tyre. Quietness is a particularly fundamental quality of an electric car, such as the Audi e-tron. The new e-tron is the first first full-electrical model from the brand with the Four Rings, which puts out a peak electrical output of 300 kW, 664 Nm of torque in boost and a range of more than 400 kilometres in the WLTP cycle. As a result, it’s an SUV with sports car performance, accelerating from 0 to 100kph in fewer than six seconds. Pirelli’s competition history dates back to 1907, when the Italian firm won the famous Peking to Paris road race, equipping the victorious Itala. But Pirelli has expressed its passion for competition not only through motorsport: the Milanese firm is also present in winter sports, now sponsoring the World Skiing Championships for the second time (following the 2017 edition in St. Moritz in Switzerland). Pirelli has also confirmed its support for this year’s World Ice Hockey Championships in Slovakia: next year the competition will take place in Switzerland and in 2021 in Belorussia and Lithuania. Pirelli will also be the main sponsor of the 2021 World Skiing Championships in the Italian resort of Cortina d’Ampezzo. Pirelli has additionally sponsored the Italian Winter Sports Federation, FISI (Federazione Italiana Sport Invernali) since 2015, with the agreement already confirmed until at least 2021.